Birth*: Ralph was born circa 1900. [S429] Obituaries from The Halifax Chronicle Herald Newspaper, Obituary of Ellen "Nora" MacFarlane, October 5, 2007. Doug MacFarlane of Riverview [New Brunswick] passed away suddenly at his residence on Monday, September 9, 2013. Born in Antigonish, he was the son of the late Dougald and Nora (Dyer) MacFarlane. Doug was retired from Via Rail after 40 years of service. He attended Immaculate Heart of Mary Church, was a former member of Jay Cees Riverview and a huge Blue Jays fan. He was a very social person who could always be seen walking around town chatting with friends and those who knew him. Doug loved a lot of things about life, but what he held most dear to his heart was his family - especially his six grandchildren. He will be dearly missed by his loving wife of 45 years, Carmie; son Troy (Shara) MacFarlane of Antigonish; daughter Jo-Lynn (Mike) Mullen of Riverview; his precious grandchildren, Jamie, Taylor, Isaac & Emily Mullen; and Edyn & Meghan MacFarlane; brothers, Joe (Anita) of Riverview, Kenny (Bernadette) of Antigonish; Donnie (Brenda) of Antigonish; sisters, Lillian (Mike) Power of Antigonish; Carol (Raymond) DeCoste of Pompquet; Dorothy Benoit of Pictou; and Mary (Kevin) Grant of Antigonish. Besides his parents, Doug was predeceased by a brother-in-law, Leonard Benoit. 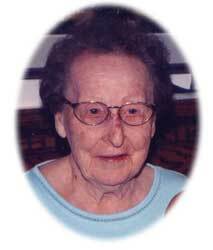 MacFARLANE, Marie Anne - 93, Highland Drive, Antigonish, passed away peacefully in St. Martha's Regional Hospital, Antigonish, December 7, 2004. Born in West Pubnico, she was a daughter of the late Henri and Therese (D'Eon) LeBlanc. Marie graduated in 1933 from St. Martha's Hospital School of Nursing, Antigonish, where she nursed until the outbreak of the Second World War in 1939. She nursed at Camphill Hospital, Halifax, enlisted in the army in 1940 and served overseas with Number 7 Canadian General Hospital RCAMAC until 1945. She married Colin Francis MacFarlane May 13, 1946. In 1965, she and her late husband began a travel agency that she was actively involved in until 2000. She was a member of the Arras Branch 59 Royal Canadian Legion, Antigonish and a 50 year member of St. Ninian's CWL. Surviving are son, Colin (Ellen), Antigonish; daughters, Roseline (Tom) Anderson, Saint John, N.B; Charlene (Steve) Konchalski, Antigonish; grandchildren, David Murphy, Graeme, Charlene, Jane Anderson, Christopher, Julianne, Maria Konchalski; great-grandson, Reese Murphy; sister, Dorothy (John) d'Entremont, Halifax.